I then wrote it in Ada. Because it seemed like the right thing to do. I then wondered how many languages in which I'd professionally developed. And how many I knew, in total. It turns out the answer to the first question was a respectful 16, while the second was a none-to-shabby 26! So, I set about re-writing the same code in each of those languages. The purpose of the exercise was (and is) to learn, re-learn, and refresh my memory of these programming languages. Therefore, I'm more focused on the syntax, data types, and structure of the code. Less so on the dev environment, test suites, or accuracy of the algorithm. Along with each code block, I have written some notes for building and running it, along with my own personal commentary. I picked the languages in an arbitrary order, so the concept of 'first' doesn't mean much. It is left as an exercise to the reader to determine the order I actually wrote them, based on my comments, and the evolution of the implementation. Since some of those languages in which I've developed were assembly languages, and some were merely different dialects of BASIC, I haven't included them all here. (But I'll get to them all, eventually, I guess!) I've developed in several proprietary languages, too, which I doubt I'll ever be able to include. Load bernoulli.amos into the editor and hit F1. I had forgotten a lot about the language... but almost none of the keyboard shortcuts. I'm not sure what it says about me, exactly, but I'm sure everyone has their own ideas about that! I kind of like the idea of meta-variables like PARAM and PARAM$ to hold the most recent return value, as it allows them to be easily optimized by the compiler - something that would have been important then, but less so now. The use of  for procedure arguments now seems alien, as they're more commonly used for arrays, but then it saved confusion between the two. I do like the nice symmetrical use of  as syntax to pass arguments both into, and out of, the procedure. I had issues with AMOS considering 0/0 as an error, rather than a result of 0. This code, which I ultimately submitted, does not have such issues. There is a bug in this, as the numbers exceed the limits very quickly. But it's not important to me, ATM, to find it. Bash is not the answer whenever the question "in what language shall I perform number crunching" but, with expr and seq it functions adaquately for small tasks, if slow. 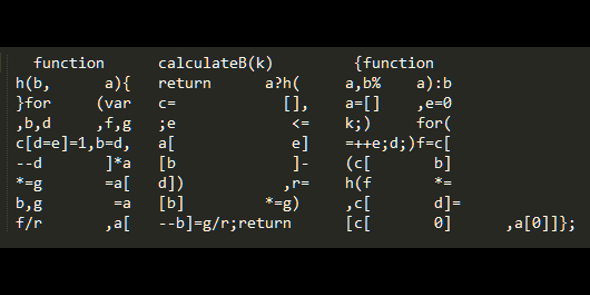 The syntax for both the maths operations and arrays, however, are ugly and (apparently) inconsisent if you're not au fait will the minutiae of bash. So much so that I used temporary values. 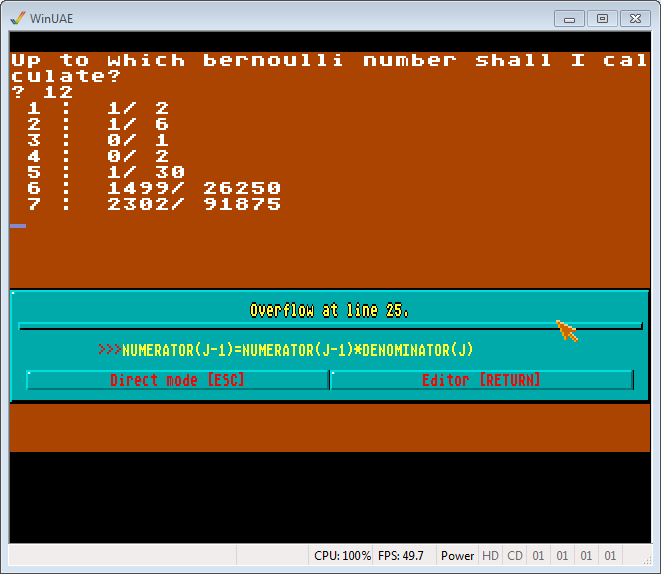 COMMENT Bernoulli calculator. 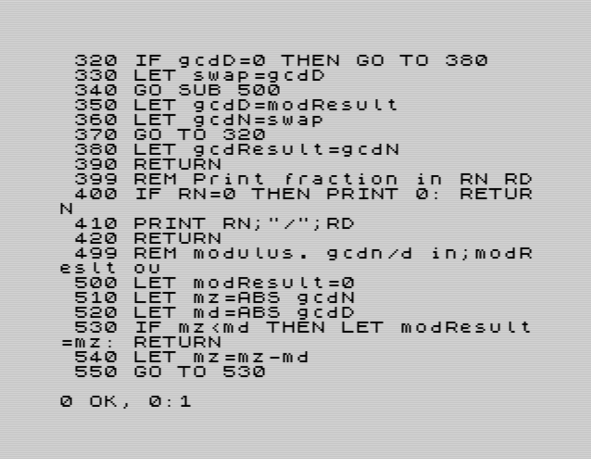 A version of the very first computer program ever written... define gcd set gcdResult to 0 while gcdB <> 0 set swap to gcdB set gcdB to gcdA % gcdB set gcdA to swap set gcdResult to gcdA end if end define define reduce set gcdA = nj1 set gcdB = dj1 call gcd if gcdResult <> 0 set nj1 to nj1 / gcdResult set dj1 to dj1 / gcdResult end if end define define calculate array numerator create size bernoulli+1 array denominator create size bernoulli+1 COMMENT When bernoulli is set to '2', this loops with m=1, m=2, and m=3 COMMENT So we need to think of 1-indexed arrays, not 0-based. (Like Ada.) repeat bernoulli+1 as m array numerator set index m to 1 array denominator set index m to m+1 if m > 1 repeat m-1 as jloop COMMENT Since Bolt loops (currently) only count up, we use this variable to reverse the order set j as m-jloop + 1 COMMENT Copy the array elements into variables, so they can be operated on array numerator get index j into nj array denominator get index j into dj array numerator get index j-1 into nj1 array denominator get index j-1 into dj1 COMMENT Now perform the calculation set nj1 to nj1 * dj set nj1 to nj1 - (nj * dj1) set dj1 to dj1 * dj set nj1 to nj1 * (j-1) COMMENT Reduce the fraction to its smallest form CALL reduce COMMENT copy the results back array numerator set index j-1 to nj1 array denominator set index j-1 to dj1 end repeat end if end repeat COMMENT Move the result into gcdN and gcdD so the calling code can use it array numerator get index 1 into gcdN array denominator get index 1 into gcdD end define define print_fraction if gcdN = 0 print at 150 bernoulli*20 + 20 bernoulli " : " 0 else print at 150 bernoulli*20 + 20 bernoulli " : " gcdN "/" gcdD end if end define COMMENT Our calculation code starts here... color text "red" print at 10 25 "Working..." color text "black" repeat 16 as bernoulliloop set bernoulli to bernoulliloop-1 call calculate call print_fraction end repeat color text "red" print at 430 320 "Complete!" This means we end up having a loop counter (bernoulliloop or jloop), for example, and a 'set' instruction immediately afterwards to 'fix' it. Copy as autorun.brs onto the SD card, and place into your player. The port to this language was straightforward, with only the += and *= operators needing the more explicit x = x * ... version. I also needed to reduce both fractions in order to get any kind of precision with 4 byte integers. Even then, I only managed 12 results, before the number system broke down. My primary reason for writing this version is that I'd recently started working for the company that created the language (BrightSign) and thought it prudent to learn a little of it. Naturally, this was an easy example with which to kick its tyres. It's shocking that I had forgotten so much about writting _basic_ C! That is, without all the modern extensions. The use of malloc and free. The use of struct. (I was tempted to typedef a few things, but decided to leave it pure as an aide memoire for language historians.) Passing pointers, instead of references. printf. At least I remembered to clean up my malloc's, and not pass pCalcList back. It has the same problems of looping backwards as many languages, and has different scoping rules that mean a local variable with a name matching a global function will cause problems. (See gcd for this.) Since the language understood (and took efforts to improve) scoping, it seems strange that they solved one problem, but created another. As a long time developer in C++ (I started in 1994) I had to roll-my-own Fraction class for this. I also forced myself into using streams, even though I rarely used them since my C++ work was always in embedded systems and graphics and so I had a custom library for rendering output. gforth bernoulli.f -e "create num 30 cells allot create denom 30 cells allot num denom bernoulli bye"
This was my biggest disappointment, to date, as the result I achieved was significantly less elegant than I'd hope for. 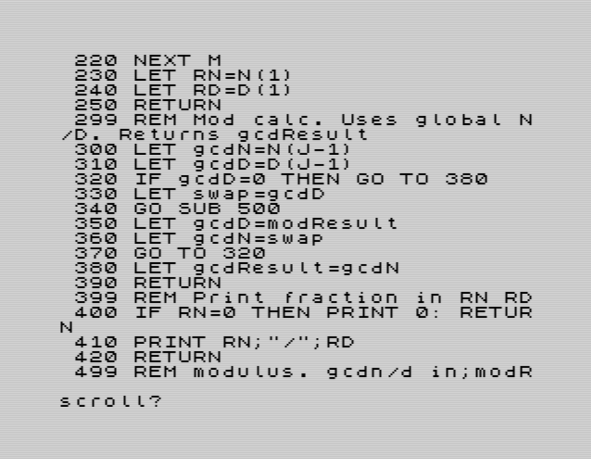 More so since I'd had a great start to the build, working on the gcd and reduce methods on a Jupiter Ace emulator on Christmas Eve! Also, I tried to work out a method whereby all calculations were performed on the stack. I gave up sooner than I should have. Again, because getting the address of the storage (and holding it a convenient variable) was problematic. I'm sure there's a way of doing this. On the plus side, the result is brilliantly fast, and the cells allow for quite high precision - so much so, that I don't mind showing off the first 30 results. I also impressed myself by inventing (re-inventing?) the 'dup 1 + dup 1 + swap' trick, which allowed me to create a do-loop that executes only once, so I can use 'I' instead of duplicating the stack top as the loop iterator. I was quite happy that I managed to utilize types and recursive functions with the intent keyword. I wasn't so happy in wasting so long in not understanding the array shape. In Fortran arrays start from 0... but only if you ask it! Consequently, my allocate(a(n)) needed to be changed to allocate(a(0:n)). 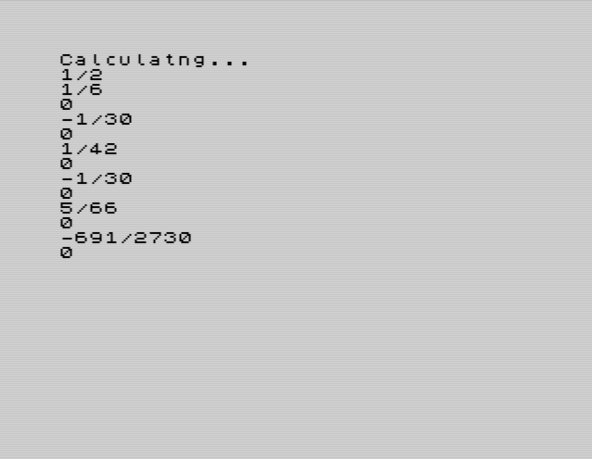 Missing this minor point caused me to experiment with two arrays (numerator & denominator) since I was getting crashes. Stupid! Here I'm mixing the data types: Fraction in some places, and numer/denom integer pairs in others. This is intentional, since I wanted Golang's ability to return multiple values. I was (and am still) very disappointed by the ability for Go to maintain accuracy when the numbers get large. It was tempting to move it to bigints, but it was late, so I postponed it. Getting the development environment work was the biggest pain, here, as the Linux version of the compiler and run-time (for some reason) decided to not match :( And the use of the -target 1.4 option of javac wasn't helping. So I (reluctantly) re-installed Eclipse for the first time in 5 years. On the plus side, my machine is now fast enough to run it! I also decided to use the 3-line version of the subtract method, which doesn't affect A[j], to gain precision. The ASCII art image was hand generated. The size of the letters was determined by the keywords which _couldn't_ be positioning anywhere else. e.g. function and return. Whoah! One of the holy grails, and I finally managed it. It's not pretty, and it's certainly not idiomatic, but I now know why people love and hate LISP, according to temprament. Perhaps strangely, the reverse order (i.e. stack based) handling gave me the least amount of trouble. (No doubt to my love and minor experience with Forth.) 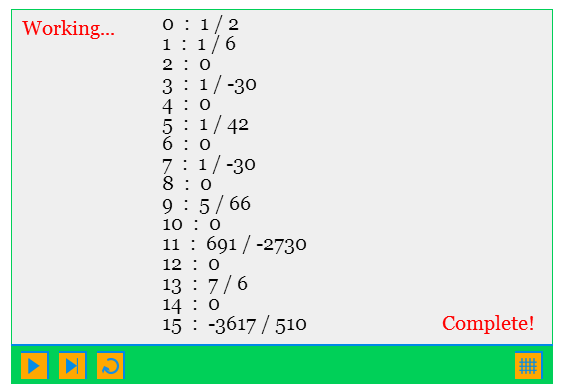 What did, however, was getting a loop to count down and terminate correctly! I had to switch my approach from setq-loop to loop-for. This stopped the first iteration from being evaluated. A simple conversion this one. By the time I got to this one, I'd given up on the 'full' version of the subtraction, and just used the 3 line code which doesn't affect the a[j] element. Even so, I was surprised by the need to simplify at each step. Without it, the numbers break down _very_ quickly! 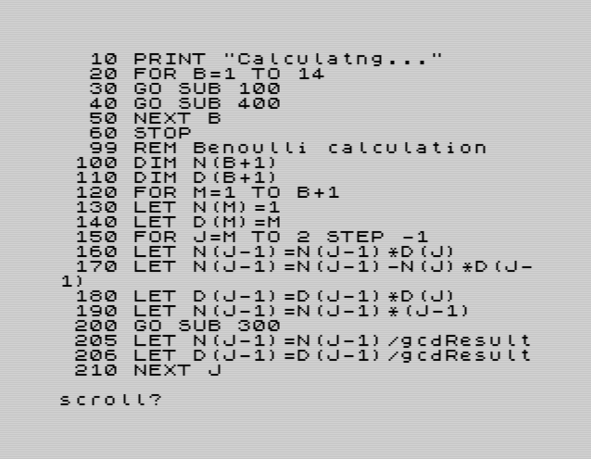 (* Taken from the 'Ada 99' project, https://marquisdegeek.com/code_ada99 *) program BernoulliForAda99; type Fraction = object private numerator, denominator: Int64; public procedure assign(n, d: Int64); procedure subtract(rhs: Fraction); procedure multiply(value: Int64); procedure reduce(); procedure writeOutput(); end; function gcd(a, b: Int64):Int64; begin if (b = 0) then gcd := a else gcd := gcd(b, a mod b) end; procedure Fraction.writeOutput(); begin write(numerator); if (numerator <> 0) then begin write('/'); write(denominator); end; end; procedure Fraction.assign(n, d: Int64); begin numerator := n; denominator := d; end; procedure Fraction.subtract(rhs: Fraction); begin numerator := numerator * rhs.denominator; numerator := numerator - (rhs.numerator * denominator); denominator := denominator * rhs.denominator; end; procedure Fraction.multiply(value: Int64); begin numerator := numerator * value; end; procedure Fraction.reduce(); var gcdResult: Int64; begin gcdResult := gcd(numerator, denominator); begin numerator := numerator div gcdResult; (* div is Int64 division *) denominator := denominator div gcdResult; (* could also use round(d/r) *) end; end; function calculateBernoulli(n: Int64) : Fraction; var m, j: Int64; results: array of Fraction; begin setlength(results, n); for m:= 0 to n do begin results[m].assign(1, m+1); for j:= m downto 1 do begin results[j-1].subtract(results[j]); results[j-1].multiply(j); results[j-1].reduce(); end; end; calculateBernoulli := results; end; (* Main program starts here *) var b: Int64; result: Fraction; begin writeln('Calculating Bernoulli numbers...'); for b:= 1 to 25 do begin write(b); write(' : '); result := calculateBernoulli(b); result.writeOutput(); writeln; end; end. As for the Bernoulli algorithm itself, it wasn't a difficult port per se. I switch to Int64 upon realized the limit of integers. Otherwise, it was strange going back to a language with such distinct definition and declaration sections but, given the age and the "declare before use" rules, it's a necessary evil. And no worse than C.
Oh, and the bounds of the for loops are inclusive. I'd forgotten how much I hated getting CPAN to work on a fresh machine until now! In the end I resorted to a manual install of the module. I've also written this is the style of Perl that I used to write, although I believe/hope that there are now better methods of passing arguments and doing reverse loops. The default print option is nice, however, and it has the best accuracy of all the standard (i.e. non-big int) libraries. Primarily because it uses Math::BigInt under the hood! This was the first version I wrote which used an external library. And it was the only time I found a show-stopping bug in a library! My thoughts was of exasperation - why PHP! It has such a bad reputation that I daren't mention the issue for ages, lest I get accused of a witch hunt. 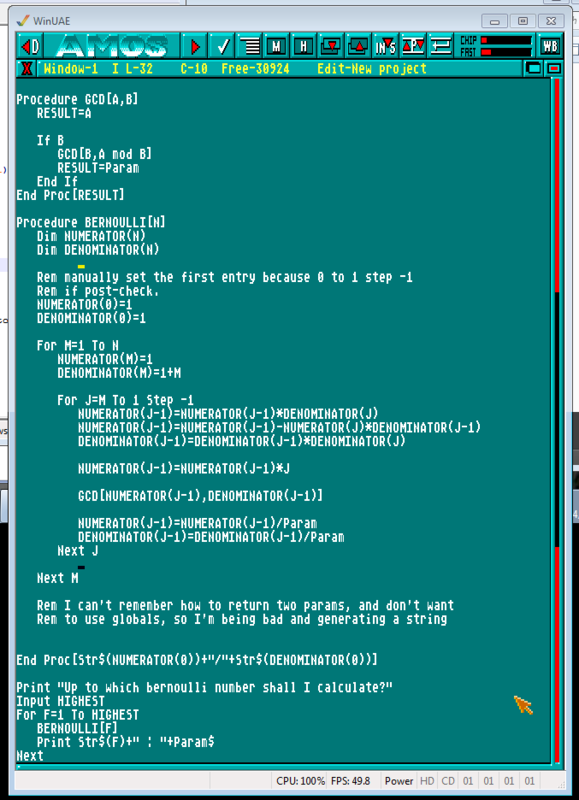 Although I have never really liked Python (Yes - it's due to the whitespace!) I have also liked the simplicity and elegance of this method. And the fact that the library worked (as opposed to the PHP version which preceded it) was a bonus. Since Python is oft-used as a command line scripting language, I decided to remind myself of the syntax for bring the arguments into play. Since Ruby was my 'day job' language, I wanted to include a few of my favourite parts of the language: ranges, downto, blocks, and last clause evaluated is returned. There's not enough scope to show all of Ruby's "good parts", alas, but I could at least show two different for loops. It's a shame the Fractional gem doesn't have a better constructor. Coding with _only_ globals is something I (now) find really difficult. ISTR I would use upper case for one, and lower case for the other, but I can't recall which way around. Thus, this version is a zombie of both as I used lower case for globals but, in retrospect, it should have been the other way around, but I was too lazy to change everything I'd just done. Additionally, I started my Sinclair career on the ZX81, where only upper case character were available. This might explain my excessive use of upper case variable names. It's also my first iterative approach to the GCD algorithm. Although, TBH, it's pretty much tail recursion so I could have taken this approach before. Also, it's my first algorithm to use GOTO as an instruction. I've used things, like sprintf, in places even though there are better mechanisms in place. My reason: I felt like it. Nostalgia. Boredom. Laziness. All of the above! No one can agreed on how scope should be implemented! should I 'reduce' or 'simplify' the fractions? the arrays are (sort of) elements of a triangle, so I've called it 'row', 'triangle', and even just 'A'. I did this because the array represents an abstract concept, and I got bored calling it 'A' all the time! If/when I consider the language useful to me in command line applications, I'll parse the user's arguments. e.g. python. But most of the time, I won't. Occassionally used the variable naming or method names from another language. Most of my work uses camelCase, so this keeps creeping into my code. Recalled memories of the workplaces in which I used them. Sometimes this is not a good feature! Sometimes I'll write a pretty printer for the result, eliminating the rendering of '0/0', for example. Sometimes, not. It depends on whether there's interesting language scructures that I could recall to do so. I ended up settling on 17 terms, as most languages will show the precision issue by then if they have it. Almost non-big int versions will suffer at the 18th term. Forth I let run further because it as so painful to get going, but when it did showed some excellent results. I never could decide my preference between 1+m or m+1. I changed between them according to aeshetics, algorithmic meaning, and boredom! My naming for the loops, m and j, were kept fairly consistent... even though the names are very poorly chosen. As with 'real' development, early mistakes and legacy naming permeates everything.